Three summers ago, I took an early morning walk from the Pacific Ocean to Century City, a distance of about six miles, along Santa Monica Blvd through both Santa Monica and Los Angeles. Here's a link to Part I and Part II from the last couple of weeks. The above aerial photo (from www.heliphoto.net) gives an idea of the topography, various neighborhoods, and total distance covered. And, obviously, taken on a sunnier day than when I went walking. The office towers of Century City are on the lower right, the studios of 20th Century Fox on the lower left; the Pacific Ocean is in the distance. According to a 2009 Los Angeles Times article, L.A. City Attorney Carmen Trutanich wants to give police the ability to arrest "taggers" simply for hanging out together, without having to catch them in the act. Sounds like a great idea, although I realize it also opens up other issues. None the less, glad City Attorney Trutanich is (was) addressing the issue. Several years ago, I had the opportunity to hear Jim Robertson, a former leader within the LDS (Latter Day Saints) Church speak about his experiences. Really interesting: dozens of Mormons, evangelical Christians and other members of other faiths came out to hear him speak (I realize this topic could be another blog entry). 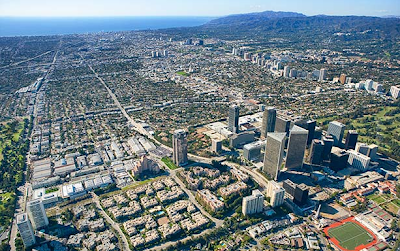 Onward to Century City - a large office, retail, and residential complex located on the westside of Los Angeles, immediately adjacent to Beverly Hills. 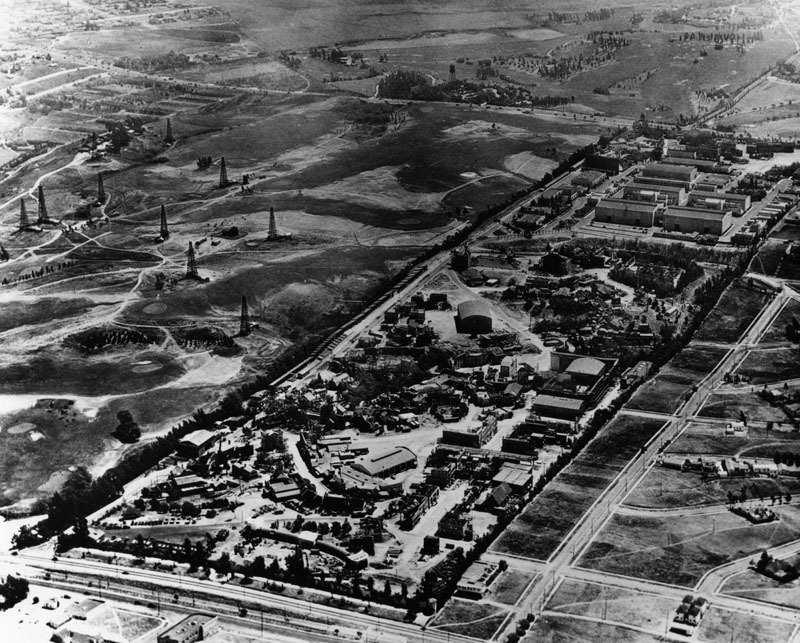 Here's a fabulous aerial photograph of the 20th Century Fox Studios backlot, circa 1928. Santa Monica Blvd (aka, State Route 2, aka, old Route 66) is running along the bottom of the property. The road separating the backlot from the oil fields is today's "Avenue of the Stars." The rise of television in the 1950's put a financial squeeze on the major studios, including 20th Century Fox. The company was forced to sell their backlot to development in order to remain financially viable. 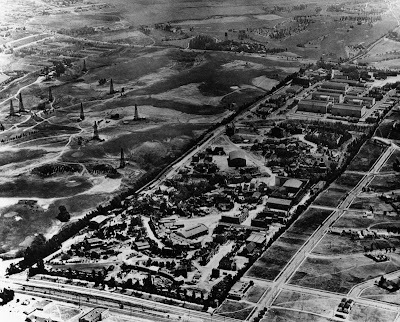 Fox continues to use the sound stages and offices in the upper right hand corner of the photo (located off of Pico Blvd). A large, outdoor shopping center (currently managed by the "Westfield Corporation"), along with several office buildings were built starting in the 1960's. My dad had an office in the Century Park West building located at 1801 Avenue of the Stars. It was the first office building in Century City and was built in 1963. It now sports a large, red (and, in my opinion, totally unattractive) "Westfield" logo. Much of the outdoor scenes were filmed here in the less than memorable 1972 Fox film "Conquest of the Planet of the Apes" - with the apes burning down my dad's office building in the final scenes. As a kid, I thought it was pretty a cool special effect. Across Santa Monica Blvd, in what's technically "Westwood," is a small office building with a 1969 Statue of Liberty mural. Apparently, the owner of several Los Angeles office buildings is pushing the envelope in terms of wrapping his buildings with murals, and eventually commercial billboards. Here's a link to a previous post on this. The Statue of Liberty mural looks "OK" ... but few of us want to see buildings wrapped in ads. My six mile walk, which started at Santa Monica Blvd. and Ocean Avenue in Santa Monica at 5:45am, ended here at the Century Plaza Hotel. The Century Plaza opened in 1966 and at one time was the premier five-star hotel in Los Angeles. Presidents and world leaders and celebrities have stayed here, and it was the location for the State Dinner honoring the Apollo 11 astronauts. Here's some additional information from our friends at wikipedia. It's still a beautiful hotel, but perhaps no longer the world famous destination, or five star resort, it once was. Apparently, Michael Rosenfeld, the local investor who owns the Century Plaza wants to tear down the building, and replace it with two fifty-story, state of the art buildings. (Sounds like the backstory of the 2008 Adam Sandler film "Bedtime Stories"). Sam Watters of the Los Angeles Times wrote a passionate article about the historic importance of the Century Plaza, and why the City should move to prevent it's demolition. On one hand, the Century Plaza is a landmark and an vital part of our City's history. It was designed by architect Minoru Yamasaki and is one of the finest examples of "mid-century" architecture in the City. And it remains a beautiful, classy (although, yes, somewhat dated) building. On the other hand, don't the owners have the right to bring their property (and Century City) into the 21st Century? To bring the Century Plaza - back to a world class, five star resort? Of course, both sides are playing the "environmentalist" card. The developers are touting how much more energy efficient a new hotel will be. The preservationists are countering that it will take over fifty years of energy savings to make up for the amount of energy it will take to both demolish the older building, and build a new one. Speaking of fifty years, I wonder what Angelenos in 2059 will think of the Century Plaza, or whatever takes it's place? As a Christian, I often what kind of legacy - spiritually, physically, morally, culturally - we're leaving for our great grand-children. Those who, God-willing, will be here 50-100 years from now. What the pslamist called "a people not yet created" (Psalm 102:18). In that sense, tearing down the Century Plaza, for something "bigger and better" seems very short sighted. Especially if the city gets something like this. Across the street from the Century Plaza Hotel is the new "2000 Avenue of the Stars" building, occupying the site of the former ABC Entertainment Center. The building is affectionately (or not so affectionately) known as the Death Star. Walking back to Santa Monica Blvd along Avenue of the Stars I passed the Century Park East building. The large grassy setbacks were cutting edge design 50 years ago. Unfortunately, they remove people - and the sense of life - from the streets. You'll see a lot more pedestrians "out and about" in the more traditionally designed (and yet lower density) areas of downtown Santa Monica than you will in Century City. I caught the 704 MTA "Rapid" back to Santa Monica. These buses really move. I know that sounds like an oxymoron, but it's actually true. Not only do they only stop every mile or so, but they each bus is equipped with special transmittal devices that cause traffic signals to favor the bus, with green lights held longer and red lights shortened. Really worked - we made great time back to Santa Monica. A last look at Century City. There's a red "Metro Rapid" heading east towards Beverly Hills on Santa Monica Blvd. Nice six mile walk. I'd like to take anther stab at Santa Monica Blvd, aka "California State Highway 2," aka "Historic Route 66," into Beverly Hills and on to Hollywood sometime in the future. 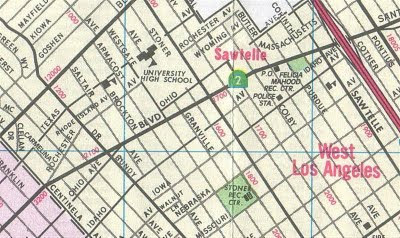 I lived on S. Bentley Ave., a block from Santa Monica and Sepulveda, in 1965-1966. Being a junior at University High School it was a great time to be there. Century City was new and there was my favorite little hamburger stand on the corner of Santa Monica and Sepulveda. I wouldn't recognize the area now. Thanks for the memories. Nice blog.